This effect costs you 50i each time you perform it. 1 feel it is worth it. You will have to decide for yourself. Fifty cents today is worth what a quarter was when I was a child. Start with two half dollars finger palmed in the right hand. The coins are held at the base of the two middle fingers. 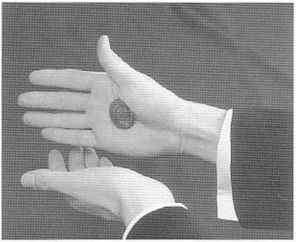 By curling your fingers over the edge of the coins, you can raise your hand to the spectator and show an empty palm. 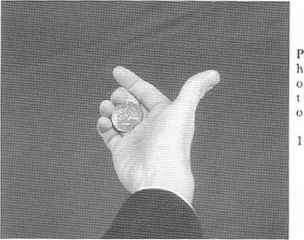 (See Photo 1) The top coin of the two, the one farthest from the palm, is a hook coin, sometimes called a "Hoo Coin". With your coins in position, stand facing the spectator. Make sure that no one is behind him. Look the child in the eye, smile, and say the following remarks: "Did you wash behind your ears today? If you did, you might have found this!" Reach up with your right hand to the child's left ear. If he glances at your right palm, he will see nothing but an empty-hand. When your hand is out of his sight, push the hook coin forward with your right thumb and attach it to his shirt at the top of his left shoulder. Immediately push the regular half to your fingertips and touch it to his left ear. Bring the half dollar forward and take it with your left hand. Say: "Maybe there is another one!" Now with an empty right hand, reach up to his shoulder and retrieve the hook coin. Touch it to his ear again and bring it forward. Hold the hook coin at your right fingertips, hook away from the fingers and say: "We don't need this one!" Drop your right hand to your side, hooking the coin to your right pants leg. Immediately make a tossing motion with your right hand. Show the hand empty. The coin has vanished! the reader to ]. B. Bobo's book, "The New Modern Coin Magic." Check the "Simple Vanish" on p. 23. Extend your closed left hand toward the child and say: "Keep this one for luck!" 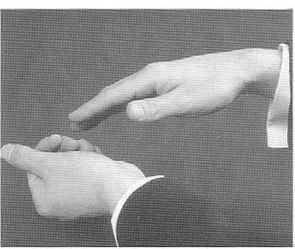 Open your left hand and show that the coin has vanished. Pause--then extend your right hand to shake his right hand. Say, "Thanks for helping me!" As you shake his hand, drop the palmed coin into his hand. The hand-shaking business and dropping the coin is an idea of lack Chanin's.